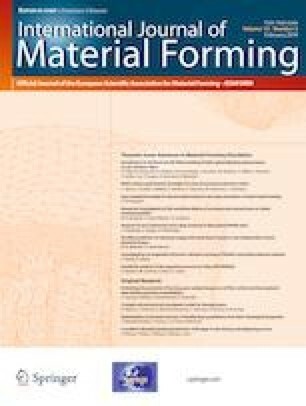 In this study, to eliminate the extrudate swell, melt fracture and extrudate distortion problems of polypropylene (PP) micro-tube, the experiments of gas-assisted extrusion forming was firstly carried out. Meanwhile, a set of modified gas-assisted extrusion system was set-up, and a kind of novel gas-assisted die was also designed and manufactured. Under the role of gas-assisted extrusion system, PP micro-tubes were successfully prepared. Moreover, the macroscopic and microscopic qualities of PP micro-tubes for gas-assisted extrusion were obtained and compared with those of the traditional extrusion. Experimental results show that gas-assisted extrusion not only overcomes extrudate swell, but also greatly improves the smoothness and transparency of PP micro-tube. In addition, to ascertain the mechanisms of gas-assisted extrusion of PP micro-tube, numerical simulations were also performed. The swell ratios, flow velocities, pressure and stresses distributions of melt for gas-assisted extrusion and traditional extrusion were analyzed and compared. Moreover, the effects of inner cavity’s gases pressures and traction force on the gas-assisted extrusion of PP micro-tube were numerically investigated and discussed with the traditional extrusion. Numerical results show that the swell ratio of PP micro-tube increases with the inlet volume flow rate for traditional extrusion, but it is nearly equal to 0 for the gas-assisted extrusion. Moreover, due to the assistance of gas-layers, not only the axial flow velocity of melt is uniformed and radial flow velocity is removed, but also the pressure, shear stress and first normal stress difference of melt are all greatly reduced, especially at the outlet of die. These weakened pressure and stresses diminish the elastic energy storage and tensile stress of melt, and finally result in the elimination of extrudate swell, melt fracture and extrudate distortion. With the increase of inner cavity’s pressure, the inner and outer radiuses of the gas-assisted extrusion of PP micro-tube all increase, but the wall thickness decreases because the swell ratios of inner radius are all larger than that of the outer radius. In addition, under the same traction force, the sizes of gas-assisted extrusion of PP micro-tube are smaller than that of the traditional extrusion, although the sizes for the both extrusions of PP micro-tube all exponentially decrease with the increase of traction force. Moreover, the extrudate radial swell and melt fracture problems for the traditional extrusion are always existed at the outlet of die although the radial swell of melt decreases with the increase of traction force. However, the extrudate swell and melt fracture problems are greatly removed by the gas-assisted extrusion. This study was funded by National Natural Science Foundation of China (grant number 51763011, and 61764006) Natural Science Outstanding Youth Foundation Project of Jiangxi Province (grant number 2018ACB21006), Top-notch Talent Foundation Project of JXSTNU (grant number 2014QNBJRC004), and Doctor Start-up Foundation Project of JXSTNU (grant number 2017BSQD021). The authors declare that they have no any conflict of interest.